A couple of weeks ago I started a new fat burning Fat X Project. This Fat X Project was code named BBB, short for bomb bikini body. 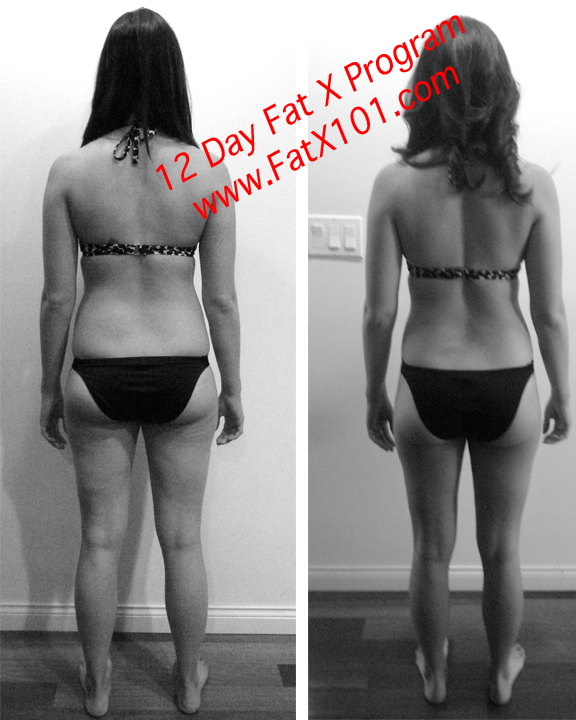 The goal was to get through the Fat X Program in 12 days, and come out with less fat, and a more toned body that would be well on it's way to looking great in a bikini. This Fat X Project would be the most trying for me as subject BBB was my own girlfriend Elizabeth. As anyone knows, training your significant other can be a challenge. I've actually had other fitness trainers pay me to train their significant other because of how much of a challenge it can be. Elizabeth was motivated to get her bikini body but the skepticism as to the power and effectiveness of the the Fat X Program lingered. Getting her to change her diet habits and follow the Fat X diet philosophy was and uphill battle. Luckily, towards the end of the 12 day fat burning program we finally ironed out the kinks in her diet. While Elizabeth got excellent results for 12 days, I always like to look back at my public Fat X Projects and write about things that went well, and things that didn't go so well in an effort to help those that are planning on doing the Fat X Program. As I mentioned before, she was highly motivated, so getting her to do the workouts was easy. She would actually watch the fat burning workout videos before she showed up and it would make explaining the routine a bit easier. Where I went wrong is underestimating her strength. I do believe we could have used heavier weight. Using the heaviest weight possible is something that I advocate as it renders the best results. Next time I would use heavier weights to maximally stimulate her metabolic processes. The decision to go ahead with this project was a last minute decision, so the first few days on the diet were a bit rocky since we hadn't shopped for her food. I advocate shopping for groceries before starting the Fat X Program to make sure you get a good start on the diet. This is another detail that could have helped produce better results. If you're new to Fat X 101 and you're planning on doing the Fat X Program, I hope this helps. Remember to download the workout manual as there are some adjustments that aren't in the free fat burning workout videos. Good luck!